WASHINGTON — Metro is significantly expanding a crackdown on fare evasion that the transit agency believes has worked at a number of stations, but that has prompted concerns over enforcement. 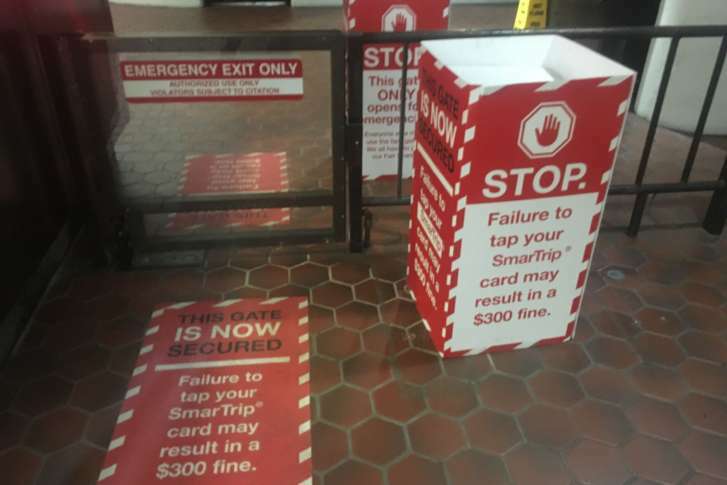 Metro says less fare evasion took place at Fort Totten and Gallery Place stations where additional locks prevented the regular use of emergency exit swing gates. Those locks will be installed at all rail stations over the next few years. Metro tested the extra-secure swing gates at the stations where it believed the most fare evasion happened. The program “was determined to be effective at reducing — but not eliminating — fare evasion,” according to Metro Board documents. Currently, most swing gates open both ways. The new swing gates will only open to allow people to exit in an emergency. The enhanced gates will be magnetically secured and an alarm will sound when they are improperly opened. The alarm also triggers a flashing light in the station manager kiosk. Gates will be designed to close automatically. Fare barriers will also be raised to a height of 4.5 feet. Metro also plans to install video monitors and automated passenger counters at elevator entrances and exits away from station manager booths. After half the stations are done this summer, another 28 stations are expected to see the changes by spring 2019. Upgrading the swing gates costs about $65,000 per station. The remaining stations, where more extensive changes are needed to comply with the Americans with Disabilities Act, would be changed later when Metro installs brand-new fare gates in coming years. In addition to money Metro loses directly when people do not tap in to the rail or bus system, Metro loses additional funding based on federal ridership formulas. Metro staff believe the changes to boost fare enforcement have lifted ridership counts by as much as 2 percent. Other attempts to boost ridership to draw more federal formula funds include the University Pass that provides unlimited rides each semester to students at participating universities for a single flat discounted rate. The Metro Board is set to make that program permanent later this month. The Metro Board is also due to get an update Thursday on the District’s Kids Ride Free Program. While that D.C.-funded program for students in the District’s public schools is popular, it runs into issues with the city’s DC One Card school identification and other problems. Metro has proposed switching to a SmarTrip-based pass. Disputes over fares are also one of the most common drivers of assaults on Metro workers. “Due to the risk of assault, bus operators and station managers play a limited role in fare enforcement,” the Metro Board documents said. The enforcement is supposed to fall to Metro Transit police, but officers are only at a fraction of station entrances and on limited bus routes. Metro hopes an information campaign emphasizing the need to tap cards for each trip could also increase rider compliance.